The warehouse at Atlantic Shippers is actually three separate buildings, connected to form the shape of an "L". Each warehouse has approximately 51,000 square feet of flat, open storage space. The dimensions of each warehouse are approximately 100 feet by 504 feet, with an inside height of approximately 20 feet. 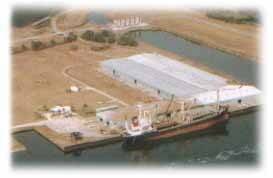 Atlantic Shippers has been handling bulk animal feed for over thirty years. The facility is equipped to accommodate the special handling needs of our customers. Atlantic Shippers offers grinding, blending, turning, and product treatment service. Open outside storage is available. Atlantic Shippers offers both bagging and debagging service and is accustomed to handling fifty pound, hundred pound, and fifty kilo bags. We can load/unload floor stacked bags or bags on pallets to or from boxcars, trucks, and containers. Atlantic Shippers has the capability of loading and unloading bulk vessels and barges. The berth can accommodate ships in need of lay berthing service. Ships/barges are unloaded at our dock via a grab discharge. The product is dropped through a dock hopper into dump trucks. The trucks deliver the meal from the dock into our warehouse. Ships/barges are loaded via a conveyor which carries the product from the warehouse and drops it into the cargo hold. Atlantic Shippers can handle about 1,500 tons of animal feed per day on regular time (6 a.m. to 7 p.m. Monday through Friday). The Sabine-Neches ship channel is 40 feet deep. Atlantic Shippers is about to start a project which includes repairing a portion of the bulkhead and dredging in front of the dock. When the work is finished, Atlantic Shippers will have 700 feet of dock and a maximum draft of about 32 feet. The facility is equipped to load/unload bulk or bagged product to or from rail cars, truck, and containers. Truck access is via Interstate 10, and rail service is provides by the Kansas City Southern Railroad. Atlantic Shippers offers sampling service so our customers can monitor the quality of their product while it is in storage. If heating is a concern, Atlantic Shippers periodically probes bulk product in order to monitor temperature. Grinding/Screening - This is a two step process. First, bulk animal feed is dropped through a wire mesh screen and into a hopper. The wire mesh screen captures foreign object such as string, wire, bags, and chunks of concrete or metal. During the second step, the product moves from the hopper through the grinder, which is equipped with a magnet. The magnet picks up any metal that might have made its way through the wire mesh screen. The grinder breaks up any chunks, and the end result is a nicely ground uniform product. Turning - In the event bulk product starts to heat, turning service is available for cooling. Blending - If a customer wants to mix different bulk products, blending service is available. Product Treatment - Atantic Shippers has the capability to apply antioxidant/ ethoxyquin or salmonella control/Termin-8. Atlantic Shippers constantly monitors all products received, stored, and shipped from our facility. Our customers receive daily reports, which provide detailed information regarding shipments in and out of the facility, as well as current inventory balances by product.